12:30 pm Interim Dividend: AIA Engineering said the board of directors of the company has declared an interim dividend of Rs 8.00 per share (400 percent) per equity share on 9,43,20,370 equity shares of Rs 2.00 each for the financial year 2017-18. The above interim dividend is expected to be paid/dispatched on or before 20th April, 2018, it added. 12:25 pm Rel Infra moves Goa Court: Reliance Infrastructure Limited has filed an application in the Commercial Court, North Goa seeking the Court’s direction for the payment of the arbitration award it has won recently against Goa Government. In its Application filed under section 9 of the Arbitration and Conciliation Act, 1996, Reliance Infrastructure has sought the Court’s direction to Goa Government to pay an amount of Rs 278.29 crore with interest totaling to Rs 292 crore, which was awarded by the Arbitration Tribunal in its Award on February 16, 2018. The Tribunal had ordered payment of interest at 15 percent per annum on the total award amount if Government of Goa fails to pay the entire award amount by April 15, 2018, the company said. 12:15 pm Oil Update: Oil prices were firm, buoyed by a surprise decline in US crude inventories as well as ongoing supply cuts led by OPEC, although a relentless rise in US oil output threatens to undermine efforts to tighten the market. US West Texas Intermediate (WTI) crude futures were at USD 65.19 a barrel, up 2 cents from their previous settlement. Brent crude futures were at USD 69.44 per barrel, down 5 cents from their last close. 12:05 pm Market Update: Benchmark indices erased gains in noon, with the Sensex falling 20.11 points to 33,116.07 and the Nifty declining 6.40 points to 10,148.90. 12:03 pm Market Outlook: “It (the market) is certainly in a better zone than around mid-January levels, but I don’t think valuations are at a place where it is comfortable,” Sanjay Mookim, Director-India Equity Strategy at Bank of America Merrill Lynch told CNBC-TV18 in an interview. In fact, from a broader markets perspective, the PEs could see an additional 10 percent fall. Having said that, the flows into the market is encouraging, he said, adding that he hopes that the trend does not reverse. However, it may not be a respite from the market’s fall further. Speaking on risks from crude price rise, Mookim said that it could remain rangebound around the levels of USD 60 per barrel. 11:52 am ICICIDirect on Banks: ICICIDirect said the banking sector has begun the calendar year with an in line performance by the Bank Nifty with the broader index up 1.5 percent (January 1-February 12, 2018). However, grappling with twin balance sheet problems, PSU banks remained under pressure with absolute return of -5.6 percent during the same period. Post announcement of the PNB fraud, the intensity of problems for the banking sector, as a whole, and PSU banks, in particular, got accentuated. This has led PSU banks to underperform with absolute return of -22.4 percent YTD versus decline of around 3.3 percent in broader index. However, in the midst of pessimism, private banks emerged as outperformers with absolute return of -1.9 percent during the same period. Stressed asset ratio for banking sector is at 13.2 percent and is likely to peak out in FY18E. Incremental slippages related to frauds and new framework on resolution of stressed asset may keep credit cost elevated in the near term, especially for corporate centric banks. Asset quality is expected to moderate from the second half of FY19. The yield surge continues to impact treasury income in Q4. It should gradually recede in FY19. Also, resolution of a few cases referred to NCLT may act as a breather, especially for PSU banks as they were worst hit in terms of NPA & provisions. In this backdrop, we expect a marginal revival in the performance of the banking sector in FY19. 11:42 am Market Update: The market was off day’s high, with the Nifty trading way below the 10,200 levels following mixed trend in other Asian peers after the US Federal Reserve rate hike. The 30-share BSE Sensex was up 39.79 points at 33,175.97 and the 50-share NSE Nifty rose 7.40 points to 10,162.70. The broader markets extended losses, with the Nifty Midcap index falling 0.7 percent. About two shares declined for every share rising on the BSE. All sectoral indices were in the red, with the PSU Bank falling 1.5 percent. On the flipside, the Nifty could see a ‘Falling Wedge’ pattern breakout once the index manages to break past the 10,250 zone and closes above the same. Till then, the strategy remains ‘sell on rallies’, he added. 11:20 am Asia Update: Asian markets traded mixed in what proved to be a choppy session after the US Federal Reserve raised interest rates for the first time this year. Japan’s Nikkei 225 rose 0.95 percent and the South Korea’s Kospi index was up 0.26 percent while China’s Shanghai Composite and Hong Kong’s Hang Seng were down 0.2-0.5 percent. 11:10 am RCom’s Asset Sale: The Supreme Court has directed Reliance Communications (RCom) to maintain status quo with respect to its Rs 25,000 crore assets sale, reports CNBC-TV18. The court will hear on April 5 a plea by State Bank of India (SBI) and RCom with regards to lifting its stay on the assets sale. Earlier too, the Bombay High Court had upheld a National Company Law Tribunal (NCLT) order staying RCom’s asset sale. 11:01 am NHPC in focus: The company informed exchanges that Unit II (110MW) of Kishanganga HE Project, Jammu & Kashmir has been synchronised with the grid on March 21, 2018. 10:50 am Buzzing: Hindustan Construction Company share price fell nearly 13 percent after a media report indicated that India’s first private hill city project Lavasa, envisioned by infrastructure major chairman Ajit Gulabchand, could be heading for bankruptcy. disorders associated with Neurodegenerative diseases. These patents are valid through 2027, 2034 and 2036 respectively. 10:37 am Market Update: The market continued to trade higher after the Federal Reserve’s rate hike and forecast of 2 more hikes in 2018. 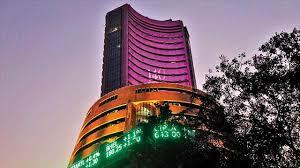 The 30-share BSE Sensex was up 132.04 points at 33,268.22 and the 50-share NSE Nifty gained 34.20 points at 10,189.50. The midcaps turned lower, with the Nifty Midcap falling 0.3 percent on weak market breadth. PSU Bank index extended losses, falling more than half a percent amid more banking frauds. 10:25 am Credit Rating: Ipca Laboratories said CARE Ratings has re-affirmed its ratings to the company’s long term / short term bank facilities amounting to Rs 1,140 crore at AA-Stable / A1+. 10:15 am China Sanctions: President Donald Trump is poised to unveil sanctions against China for the “theft” of US intellectual property tomorrow, a White House official said, teeing up a second potential trade war in as many months. It is just weeks since Trump short-circuited White House deliberations and announced a raft of sanctions on foreign-produced steel and aluminium off the cuff. 10:05 am Board Meeting: Dish TV said a meeting of the board of directors is scheduled to be held on Monday to consider and initiate necessary incidental actions in relation to the scheme of arrangement for amalgamation of Videocon D2H into and with Dish TV India. 9:55 am Rupee Trade: The rupee rose 10 paise against the US dollar to 65.10 at the interbank forex market amid weakness in the greenback after the US Fed raised benchmark lending rate by 25 bps. The dollar extended losses overseas after the US Federal Reserve stuck to its target for interest rate hikes this year. The central bank’s Chairman Jerome Powell forecast a steeper path of rate hikes in 2019 and 2020, citing improving economic outlook. Forex dealers said persistent inflows of foreign funds and weakness in the dollar against other currencies overseas supported the domestic unit. Yesterday, the rupee had ended almost flat at 65.21 against the US dollar. 9:45 am Market Update: The market gained strength amid mixed global cues after the US Federal Reserve announced its first interest rate hike of the year and sees 2 more rate hikes in 2018. The 30-share BSE Sensex was up 138.34 points at 33,274.52 and the 50-share NSE Nifty rose 49.40 points to 10,204.70. About two shares advanced for every share falling on the BSE while all sectoral indices were in the green barring PSU Bank. 9:38 am Buzzing: Genus Power Infrastructures share price gained 3 percent on bagging an order for supply, installation, shifting & commissioning of 30,000 3Q meters, LT CT & HT meters with accessories including generation of first bill cycle & other incidental services. The value of the order is pegged at Rs 125 crore. “We have won an order under the government schemes – Deendayal Upadhyay Gram Jyoti Yojna (DDUGJY) and Integrated Power Development Scheme (IPDS). The meters are to be installed at CESU, NESCO, SOUTHCO and WESCO utility in Odisha on turnkey basis,” the company said in its filing. Supplies are to begin in Q1FY19. This is a significant milestone for Genus which will enhance our market position as a technologically advanced meter supplier, it believes. Post this, its total order book stands at Rs 1,260 crore. 9:34 am Order Win: IRB Infrastructure informed exchanges that the company has emerged as a preferred bidder for the project of six laning of Hapur bypass to Moradabad section including Hapur bypass from Km 50.000 to Km 148.277 of NH 24 in Uttar Pradesh on DBFOT basis under NHDP Phase V project. 9:30 am Buzzing: Shares of Sun Pharmaceutical Industries gained as much as 3.4 percent in morning as it has received USFDA approval for its psoriasis drug Ilumya. Ilumya generically called as tildrakizumab-asmn falls in the category of specialty drugs – medications that treat complex or rare diseases such as cancer, autoimmune disorders, skin conditions among others. Ilumya is used for the treatment of the most common plaque psoriasis – a chronic immune disease that appears on the skin. 9:25 am Gainers & Losers: Reliance Industries, L&T, Tata Motors, Vedanta, ONGC, Bharti Infratel, Eicher Motors, Sun Pharma and ITC gained up to 2 percent. SBI, ICICI Bank, BPCL, Wipro, HPCL, NTPC, TCS, Axis Bank and Mahindra & Mahindra were under pressure. 9:20 am IPO opens: ICICI Securities has opened its initial public offering 7,72,49,508 equity shares for subscription. The company has fixed issue price band at Rs 519-520 per share. The subsidiary of country’s largest private sector lender ICICI Bank has raised Rs 1,717.25 crore from anchor investors on Wednesday, the day before issue opens. The broking subsidiary of the bank has finalised allotment of 3,30,24,165 equity shares to 28 anchor investors at a price of Rs 520 per share. The offer will close on March 26, 2018. Bids can be made for minimum 28 equity shares and in multiples of 28 equity shares thereafter. 9:15 am Market Update: Benchmark indices opened flat amid weak global cues after the US Federal Reserve raised rates and 2019 GDP projections. The 30-share BSE Sensex was up 14.98 points at 33,151.16 and the 50-share NSE Nifty gained 6.30 points at 10,161.60. Nagarjuna Fertilisers, NFL, FACT, Chambal Fertilizers, HOEC, SPARC and VA Tech Wabag gained up to 5 percent. Balrampur Chini, Idea Cellular, Canara Bank and Union Bank were under pressure. 9:10 am Market Outlook: Dharmesh Shah of ICICI Direct.com Research said he expects the index to find a breather around key value area of 10,000-9,900 amid a rise in volatility owing to FOMC rate decision and witness a pullback towards 10,450 in the coming weeks. Thus, he advises investors to avoid creating aggressive shorts at the current juncture and instead look to accumulate quality stocks in a staggered manner for the medium-term. On the higher side, the Nifty has a major resistance near 10,450 as it is the 61.8 percent retracement of the recent fall (10,632–10,142) at 10,444, which also coincides with the high of the previous week at 10,478. 9:05 am Stocks in news: Mahindra Holidays allotted 1,15,000 shares of Rs 10 each under ESOP scheme. Dena Bank has made annual interest payment of Rs 40 crore on its 10.20 percent Basel-III compliant AT-I bonds series III. UltraTech Cement’s MD says we were not told about potentially suspect transactions. Havells India has appointed Shashi Arora as CEO of Lloyd. 9:01 am Market Pre-opening Trade: Benchmark indices started off pre-opening trade on a positive note, with Sensex rising 90.32 points to 33,226.50 and the Nifty gaining 17.70 points at 10,173. 8:59 am Market Cues: The market is expected to open mildly higher, tracking positive trend in SGX Nifty futures but there could be volatility amid weak global cues after the US Federal Reserve met expectations by raising interest rate by 25 bps and upped 2019 GDP projections. The SGX Nifty is indicating a positive opening in the Indian market, rising 16 points 10,194.50. US stocks ended slightly lower on Wednesday, with major indexes giving up gains in choppy trade after the Federal Reserve raised US interest rates, while a strong gain in the energy space helped limit losses, Reuters reported. The Dow Jones Industrial Average fell 44.96 points, or 0.18 percent, to end at 24,682.31, the S&P 500 lost 5.01 points, or 0.18 percent, to 2,711.93 and the Nasdaq Composite dropped 19.02 points, or 0.26 percent, to 7,345.29. Asian markets traded mixed early on Thursday after the US Federal Reserve raised interest rates for the first time this year. Japan’s Nikkei 225 edged higher by 0.15 percent although the broader Topix was off by 0.03 percent, CNBC reported.